It was early in week one that I realised I would have to learn the language. I had sat through a long meeting in a state of growing confusion as the people around me gabbled at each other at Gatling-gun speed. I heard the odd familiar vowel and was even able to recognise a word here and there, but otherwise I was a picture of bovine, slack-jawed befuddlement. ‘Utilise our creative collateral…’, ‘leverage the five channels…’, ‘facilitate greater exposure of the principals…’, ‘low-visibility horizon…’. What on earth were these people banging on about? Should I turn them off and back on again? As time wore on, one thing, if nothing else, became clear: if I wanted to make it to week two, I would have to learn to speak PR. This was an unexpected bump in the road. 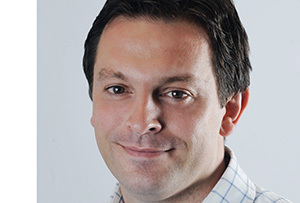 I had recently left the Telegraph to return home to Scotland and join a start-up strategic communications consultancy. Stepping from one industry into another was inevitably going to bring challenges. Still, I comforted myself with the thought that both shared a root: the noble art of communication. What did I know? The vocabulary of journalism is frank and straightforward. The internal conversations between hacks are robust, usually mutually antagonistic and at all times firmly Anglo-Saxon. But the words delivered to the reader, listener or viewer – need to be clean, clear and simple. Clarity is all. 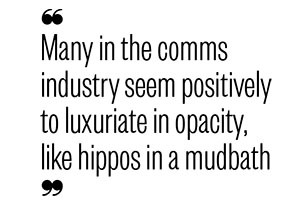 In contrast, many in the comms industry seem positively to luxuriate in opacity, like hippos in a mudbath. It is a world of dense phraseology, reckless verbal innovation and subversive redefinition: almost punk in its refusal to play by the regular rules. My favourite recent example ‘explained’ how companies can ‘strengthen their talent pipeline and improve their end-to-end recruitment journey as well as the importance of targeted demographic face-to-face engagement’. Nailed it, whatever ‘it’ may be. Anyway, I made it to week two, and have recently completed week 52. I have gradually become acclimatised to very smart people talking complete cobblers – and even learned that there are often very good ideas lurking amid the gobbledegook. I still occasionally lose my rag in meetings when confronted by an impenetrable piece of jargon, but less often than I used to, and I’ve definitely started to swear less. When I used the phrase ‘elevator pitch’ in a newspaper column recently, I knew I was on my way to full assimilation. We in Scotland had quite the 2014. The referendum was a national square-go, splitting friends, families and colleagues like nothing before it. Whatever you might hear, there’s still a fair amount of division, pain and bruising. How could it be otherwise after a year of harsh words, high passions and heated arguments? But while on one level it was a mentally and even physically draining experience, on another it was simply extraordinary. For months before the vote, the ‘indyref’ was the main topic of conversation in pubs, schools and workplaces, at football matches and in supermarket queues. The public space was jam-packed with people of all ages, many of whom had previously paid little attention to politics or policy. Scottish democracy was vibrantly and giddily alive. In the end – happily, for me – we decided to stay part of the UK. But it was a relatively close-run thing and the argument is far from over. It’s clear, too, that the rest of the country now needs to have a serious conversation of its own – what is Britain? How does it adapt to the 21st century? How do we co-exist, distinct but together? None of these questions are easily answered, but they should be tackled head on. But now we’re heading for the general election, with the polls suggesting support for the SNP is so high it could leave Labour with only a handful of seats. And we have a terrific array of political talent, in new first minister Nicola Sturgeon, new Labour leader Jim Murphy and the Scottish Tory leader Ruth Davidson. Next year, there are elections to the Holyrood Parliament and then, potentially, an EU referendum in 2017. If there’s such a thing as too much democracy, I suspect the Scots are about to find out. There are many things that take you by surprise when you leap from the cosy corporate bosom into the skinny arms of the entrepreneurial start-up. Sure, there are the obvious things such as getting paid, getting your IT set up, letting people know you exist, getting used to being the little guy – and, of course, ensuring that you don’t fall over, as so many do, quite quickly. But also: what colour do you paint the walls? After 20 years in offices made up of preordained, stain-proof blue carpet squares, mass-ordered utility desks and submarine lighting, you are suddenly confronted with the kind of choices that can challenge a chap’s skill set: light shades and lamps, rugs, art, mirrors, a toilet seat… it was at least a quick and definite no to the branded rugby tops. As for the paintwork, we opted for Stony Ground (walls), London Clay (doors) and Slipper Satin (ceilings). Oh, and we have two beautiful dachshunds, Sabre and Fang. Yes, we’re available for magazine shoots.